First, there was the OWLE, which added a wide angle converter onto a handheld rig that you could slide your iPhone into. Then came PhotoJoJo’s crazy DSLR adapter which gave your iPhone images depth of field. But with the new iPad’s redesigned camera, how can you make it a serious video recorder? Add The Padcaster. Being showcased by MewShop at NAB, the Padcaster is really three different gadgets. First, it’s an iPad case thanks to it’s polyurethane insert. 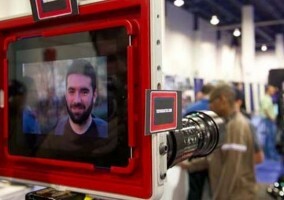 Then, it has a rigid aluminum frame which can house the iPad insert or be used as a DSLR cage. It has multiple threaded holes to mount onto a tripod, add lights or microphones to. Lastly, with it’s optional lens adapter bracket (dubbed the Lenscaster), the Padcaster can use DSLR lenses and achieve some great depth of field and rack focus while shooting. The mount bracket is universal, so you can use any standard 35mm lens adapter along with it. So it doesn’t really matter what family of lenses you incorporate. The Padcaster was created out of frustration by Josh Apter of MEW Workshop who was looking for an easier (and let’s face it, less dorky) way to shoot video on the iPad and mount it onto a tripod as well. Apter also plans on creating a smaller version of the Padcaster so that those who prefer shooting with the iPhone 4S will be able to slide one in as well. Although he thinks the iPhone is too small a device for shooting (clearly he hasn’t been following our mobile digital filmmaking series here on doddleNEWS!). And there seems to be some allusion to offering inserts for other smart phones and devices as well, as his website also includes the phrase “phones and tablets,” a very generic usage along side the iPad. And why not? The heart of the Padcaster is the Polyurethane insert, which snugly holds your mobile device in place. So it would be easy to create other custom fit versions as well. Now I don’t think you’d take the Padcaster out in the field and shoot with it on location (although the video below shows it’s possible), but I can easily see low budget school or college TV programs, as well as cable and public access stations, using the Padcaster to create better quality programming for the Net. It can also make it far easier to shoot interviews for documentaries, where the iPad allows you to forsake bulky or expensive field monitors. So for those on a budget, the Padcaster may be the ideal accessory to get your iPad based guerrilla production off the ground. The Padcaster will retail for a pricey $200, but he’s offering a special NAB rate of around $150 if you go by his booth (SL12805) and let him scan your credentials.